The right welding book by a gifted instructor-author will have you welding in no time. And a good book can help you push through when you hit a wall with a new project. It’s a great time to take up welding. Welding machines are more affordable, safer and easy for beginners to use. While new welders are easy to use, developing basic skills and knowledge can ensure you'll enjoy welding. Beginner frustration (lack of success) can end hobbies before the fun begins. Learn proper welding techniques from how-to-weld books, so you’ll start welding with confidence. Broaden your knowledge and skills for advanced projects with more comprehensive welding reference books. 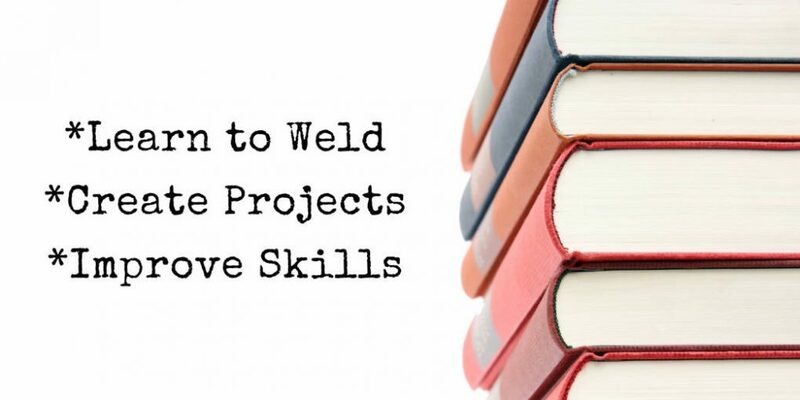 Get inspiration and support from welding project books to put your new skills to practice while making useful and attractive items. It’s clear this author has a genuine passion for welding and enjoys sharing his experience. He describes himself as a "confident handyman and consummate tinkerer." The author grew up in a family of DIY'ers and began welding at an early age. With a 120-volt MIG welder and a grinder, he opened a welding shop more than 20 years ago. His business now specializes in furniture, sculptures and business signage, but still accepts small repair jobs from neighbors. And beginners can attend MIG welding classes at his Chicago studio. Check out his work here. Who’s this welding book for? This book’s title is spot-on, with the keywords being: MIG and basics. It’s ideal for a beginners wanting to get started on the right foot with a MIG welder. Read why MIG is best for beginners. No previous shop experience? No problem! From his teaching experience, the author has learned never to assume anything about his students. In this book, you're not expected to know how to lay a grinder on the table safely. Or, that you even know what an angle grinder is. You'll also be reminded to step away from a grounded workpiece when trimming an electrode wire. Many books overlook informing beginners of this important caution. Many DIY'ers prefer this author's conversational guidance over other textbook-style instruction. The book’s style is like listening to a neighbor down the block that really knows his stuff. As far as MIG welding goes, I'm sure the author has seen it all. But he seems to remember being in your shoes and never talks over your head. You’ll get the feeling that he wants you to enjoy welding as much as he does. As one of the best welding books for workshop beginners, it will have you welding quickly—and safely. And, with the included exercises and projects, you’ll do so with a purpose. Note that this book does not cover aluminum welding or spool gun use. Complete 2 of this book’s 3 projects, and you will have the start of a strong welding foundation. With less frustration and more success, you’ll enjoy your new hobby more. With over 40 years of welding experience, the author is an American Welding Society Certified Welding Educator and Welding Inspector. While in high school, he took vocational classes to earn a welding diploma. Then, in the Navy, he worked on submarines as a Hull Maintenance Technician. He also qualified as a high-pressure plate and pipe welder. As a Community College Welding Instructor, he taught structural, pipe and production welding. Plus MIG and TIG theory and labs. This welding book is perfect for beginners who have some familiarity with shop tools and safety. No series is better than the Dummies at clearly explaining a topic using minimal technical jargon. This is a scan-able how-to textbook. You’ll find complete information in easy reading bite-sized pieces. It's all good material—as long as you’re not put off by the forced Dummies-style humor. For example, a section titled: “Getting your Welding Setup Tig-ether" <groan>. What does this welding book cover? Growing up in England, the author worked on cars, motorcycles and farm equipment. After his agriculture studies, he wrote for several farming publications. Later, he became a welding instructor. Don’t overlook this welding book because you don’t have a farm! It's suitable for complete beginners or for more experienced welders. You’ll find this detailed handbook useful whether you’re working on your homestead; out of your suburban garage; or yes, even on a farm. Geared for DIY'ers with at least some shop aptitude. This book digs into hands-on welding to repair or create metal equipment. You’ll not only learn how to weld but gain a solid understanding of how your welder works. An example is a section covering the relationship between arc length, voltage, and current. It's quite well-written and understandable. The information changed my understanding of what’s going on inside of my welder, and the effect on welds. The book is packed with helpful illustrations and photos. Including showing the differences between good, and not so good, welds. You’ll find helpful advice on how to avoid common mistakes (and fix them, if it’s too late), saving you time and money. Beyond the information in a learn-to-weld book, you’ll need a more comprehensive welding reference guide. Something on hand to solve your project-specific problems. Among many benefits, a good welding reference book will help you choose the right filler material or shielding gas. It can show you a unique welding technique. All handy for those projects that fall outside basic textbook examples. As your world of welding expands, you’ll go to your best welding books often. These valuable resources will help you to fill in your knowledge gaps. You'll have the confidence to build on your welding skills and techniques. Who is this welding book for? 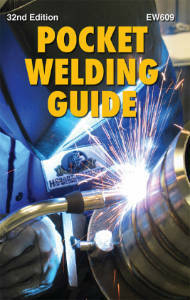 This small format (4” x 7”) guide is the best welding book for your toolbox or glove box. It's a long-time favorite of veteran welders, instructors, students, and hobbyists. Save $30 by picking this up at the Hobart Institute of Welding Technology. A Life Member of the American Welding Society with 40 years as a classroom welding instructor, Professor Jeffus is well-qualified to author this comprehensive welding guide. With over 55 years of welding experience, starting in high school, the author has accumulated a broad knowledge of welding. He has welded on boats, tanks, pressure vessels, drilling gear, aircraft, racecars, buildings, and farm equipment. If you're going to buy just one book, this could be the best welding reference book for you. It's hands-down the most useful welding book I own. A full textbook of 1000 pages, it’s a complete welding encyclopedia for me. When I go to it with a welding problem, I know I’ll find a solution. This book is definitely more expensive than less-complete learn-to-weld books. But I use the Kindle version which is usually half the cost of the hardcover edition. Be aware though, that the Kindle edition does not work on ebooks or the Kindle for Windows 8 app. But it works great for me on my tablet, laptop, and even my phone. Typical of most textbooks, this one lays a lot of groundwork for the beginner before you ever start welding. But if you stay patient with the material, you will know what to do when you finally pick up the torch. Are you interested in moving beyond hobby welding and into a career? This welding book will prepare you to complete the AWS SENSE Level I and Level II programs, a path to become a professional welder. You’ll learn something new from this book every time you pick it up. Of course, this welding book covers everything needed to get you started with any welding or cutting process safely. But it will take you so much deeper. You’ll find varied topics such as shop math, calculating welding job costs, weld testing, and inspection. Even practice lessons to help you to weld a specimen for your certification test. Learn about advanced processes like magnetic pulse welding or laser beam heat treating. I could really fill a lot of space here with what this welding book covers. The table of contents span over 11 pages. Plus 5 more pages just for practice exercises. Instead, do yourself a favor and go here. Click on the book cover to the left. There you can see the table of contents and selected pages for yourself. This way, you’ll know for sure if this welding book is right for you, or not. Be sure to check out the excellent color illustrations. This book is full of helpful, high-quality photos. But sometimes a well thought out drawing is the best way to present a technical concept. And this book is packed with them. So you’ve learned how to use your new welding gear. Now, it's time to put your new skills to work and create something. Welding project books will show you how to make attractive and practical items for home or work. Shop tables, carts, equipment stands, and outdoor furniture are favorite beginner projects. Would you like to learn to create interesting artwork for your home? Great for gifts or to sell, artistic projects are perfect for beginners. Remember, you don’t need to be an expert welder to be a great artist. Are you naturally creative? Or, are you like me, and don’t have a creative bone in your body? Either way, these books are sure to provide plenty of inspiration. So keep a notebook handy to record your ideas to adapt the projects you'll see in these books. You’ll often pick up good welding tips in project books. But don’t rely on this type of book for learning how to weld, or how to use your equipment. A great book to find inspiration for your projects. The conversational tone encourages beginner welders to overcome their doubt and begin enjoying this craft. The author presents two dozen attractive craft ideas with clear instructions and plenty of photos. 7 easy projects including garden stakes, wall-mounted coat hooks, and a mirror frame. Tables, a wine rack, a privacy screen, and a sconce are a few of the 11 intermediate project ideas. A bench and shelves make up 4 of the 6 more advanced projects. The book covers sourcing both purchased, and scrap metals, for projects. This welding project book starts with an overview of the welding and metal fabrication basics. It provides a solid refresher course if you have previous welding experience. Over 30 projects are complete with a tool and material list, instructions, blueprints, and illustrated plans. Also, the book is packed with high-quality color photos. I noticed right away how well-lit and uncluttered most of the images were. Even those with bright arcs, flames, and sparks. It’s not easy to achieve good results under actual welding conditions, but these photos are well done. For your shop - Set up your workshop with items that will last a lifetime. Horseshoes are the perfect media to explore artistic welding. Readily available new, or used with great patina, horseshoes are simple to weld and durable. You'll find horseshoes easy to handle and store. Horseshoes are so versatile for welding projects. If you can imagine something, chances are that you can make it out of horseshoes. Make engaging welding projects purely for decoration, or that also serve a functional purpose. I enjoy items where the use of horseshoes is not apparent at first glance. The creative possibilities are limited only by imagination. Get creative inspiration from a commissioned metal sculptor. The author transformed on-the-job welding skills into a full-time outlet for her artistic expression. Barbie The Welder shares her talent and inspiration in this welding project book of 30 easy horseshoe craft ideas you can do at home. I know this list of gems can help anyone become a better welder. But the best welding books can't help unless you read them. So, go ahead—choose one now! And please leave a comment if you've read one of these books, or if you know of an outstanding welding book that should be on this list.